About a year ago I wrote a blog about Best Buy's excellent use of autoresponders. My purchasing of a Flip cam on on their website triggered a whole campaign that was quite impressive. Best Buy often impresses me with their email marketing efforts. I pay attention to them, since that first positive experience. I found out today that the original triggered email campaign was not yet over. This morning I received an email from Best Buy informing me that the manufacturer’s warranty was set to expire some time next month. They reminded me of the product I had purchased and gave me an option to purchase a new protection plan for my Flip cam. It included the full details of what the protection plan covered and a clear call to action. The subject line was also clear and straightforward: Your warranty expires soon, so protect your product now. This is a perfect example about how you can use triggered email campaigns. 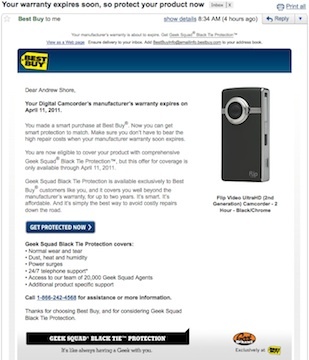 Best Buy had this type of email programmed to send almost a year after the purchase. Nobody had to design this individual email and press send. The information was pulled from a computer and the autoresponder was scheduled to send a certain amount of time after the original purchase. Here they are, so much later, with an opportunity to make another sale. Granted, with the HD video capabilities on the iPhone 4, I’m not too worried about protecting my Flip cam. But that’s a story for another day.